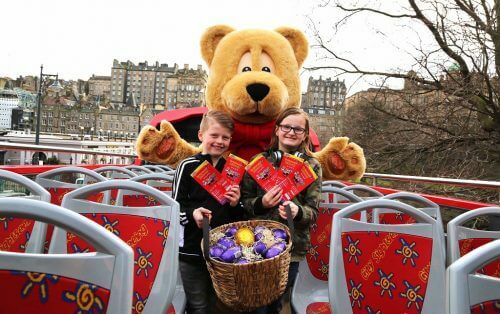 Lothian Buses-owned Edinburgh Bus Tours teamed up with House of Fraser store Jenners over Easter, offering customers an ‘Easter treat’ to mark the start of the department store’s summer season. During the Easter weekend, all bus tour customers were given the chance to collect a free Easter egg at Jenners on production of their ticket. The tours – recognised as Scotland’s second most popular paid-for visitor attraction – take in the capital’s main attractions, including Edinburgh Castle, Old Town, the Royal Yacht Britannia and the Forth bridges. Terry Deary, author of Horrible Histories, has recorded a commentary specifically for the tour aimed at primary school-aged children. Coinciding with the Easter promotion, Edinburgh Bus Tours also launched a new website – www.edinburghtour.com – designed to offer a more modern, user-friendly experience. Nigel Serafini, Commercial Director at Lothian, said: “We are excited to partner Jenners for the launch of our summer season, offering our customers a special treat this Easter. Alan Thomlinson, Store Manager at Jenners, added: “We are delighted to be continuing our partnership with Lothian this bank holiday by offering passengers a special Easter treat, a chocolate egg, when they visit Jenners.